Turd Wrangling is always a greatly appreciated gift! Any amount - your choice! Beautiful Full colour gift certificate personalized with your words and mailed to recipient in your behalf! 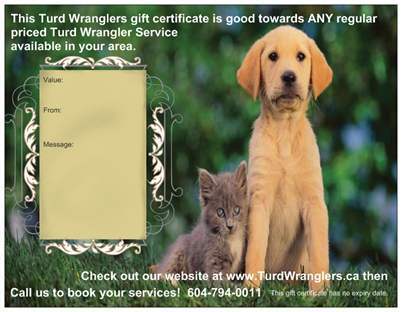 Redeemable towards any Turd Wranglers Service. to be sent directly to the recipient in your behalf by snail-mail​. Give someone you love the thoughtful gift of a clean yard, a simplified life and peace of mind​​.